Staircases can be much more than a route to other levels. They can wow as a design feature too and add a strong architectural statement within the home. Creating something exceptional requires careful thought and extensive planning to ensure they fit into the home. 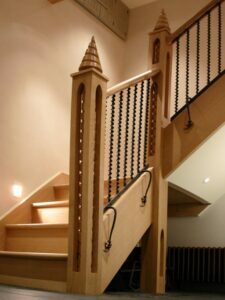 When we design a staircase, we consider not just what would look good, but how it integrates with the rest of the interior and exterior space. Then there are a host of technical considerations in terms of strength, materials and how to support the weight in the most attractive way. 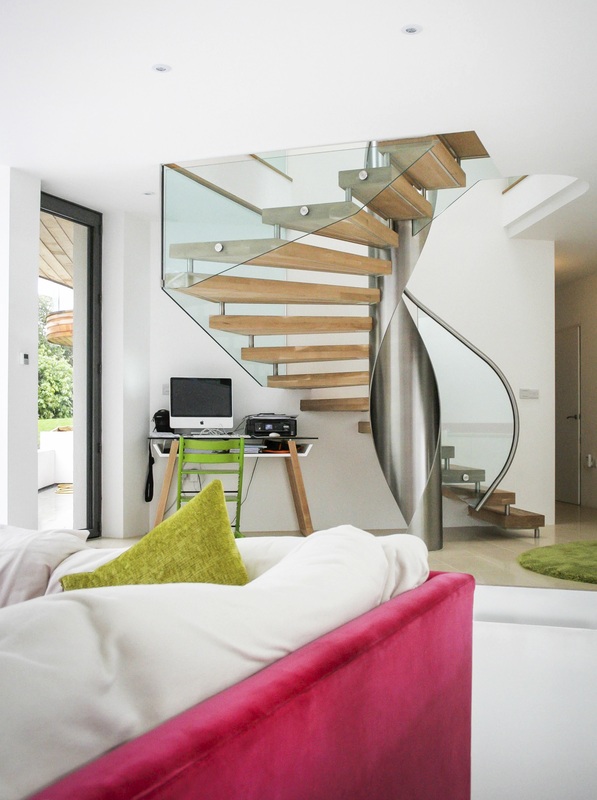 We have selected some outstanding staircase projects below to provide staircase inspiration for your next self-build or development project. This contemporary home benefits from a stunning, modern staircase. 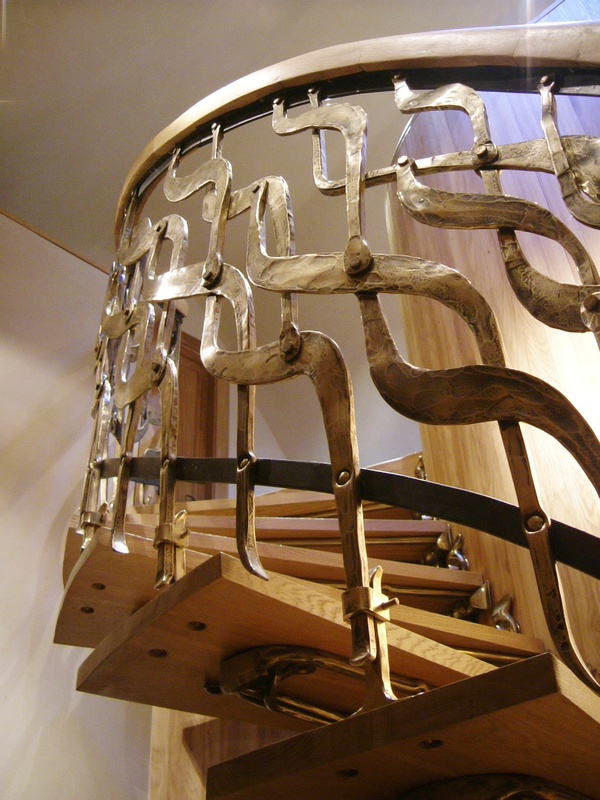 ‘Floating’ wooden treads wrap around a hollow ribbon of high grade stainless steel which gracefully spirals upwards. 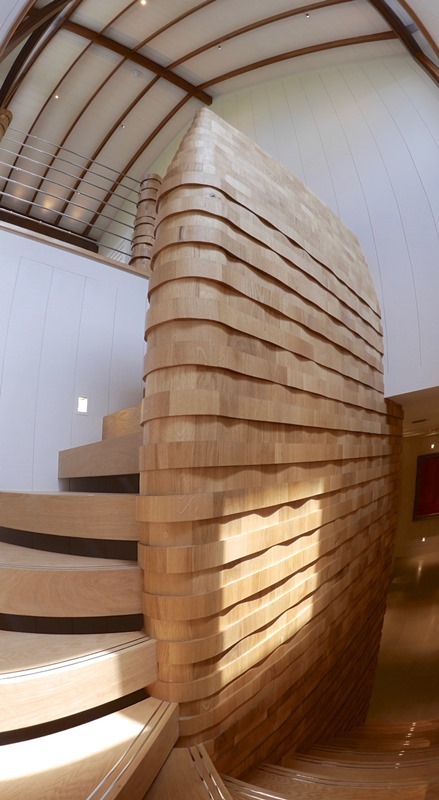 The elegance of this staircase hides a huge technical challenge. We had to plan this minutely to prevent people running up and down stairs causing resonances to ring through the steel and pull the pins out. Witcher Crawford worked with specialist structural engineers employed by fabricators, Littlehampton Welding to ensure the design was both beautiful and robust. We also specified thick glass panels to fill the spaces beneath the handrail at the top and bottom of the stairs, as well as forming the landing balustrade. For the feature staircase in this new house in the Bahamas, the drawings were based on the concept of a central spine wall; to be laid down in strata like layers of rock in a cliff face. Each layer has a different width to provide a textured appearance. 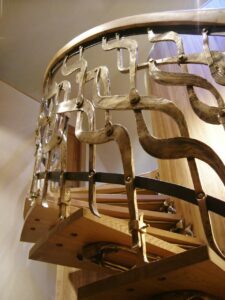 The wavy form reduces in size as the staircase climbs. A beautiful European oak was chosen to fit in with the light, Caribbean surroundings of this magnificent beach side retreat. We worked with FJ De La Haye Joinery, who transported the components from its workshop in Jersey ready for installation by their team in the Bahamas. Subtle wash lighting was used to highlight the relief cladding on the central core and cedar solar shutters were designed in tandem with the staircase. Sometimes the location of the house informs the design of the feature staircase. In this case, this amazing lighthouse staircase sits in the entrance hall of a sea side home in Jersey, welcoming guests as they enter. Nautical inspired features pop up all over this marine lover’s home. 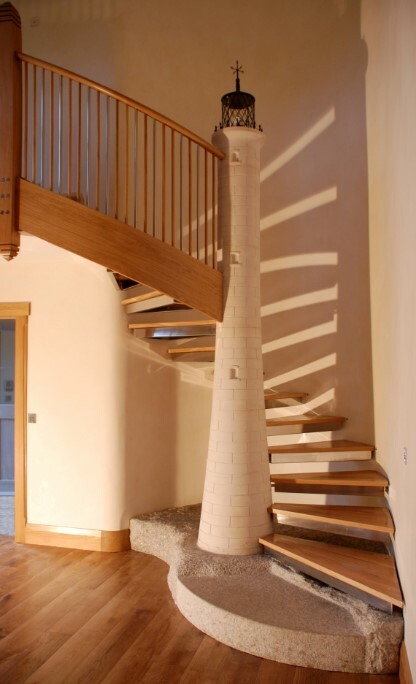 A beautiful shadow is cast on the curved wall behind the lighthouse thanks to spaces between the oak treads. Never underestimate the value of a staircase. One strong feature can lift the interior of any refurbishment or new build, while a drab staircase and entrance hall can disappoint the visitor no matter how stunning the exterior architecture of your project. 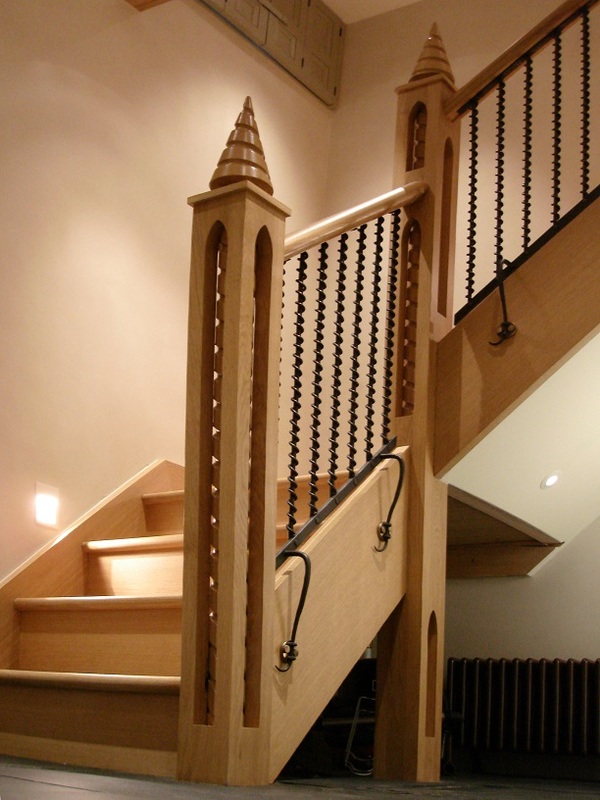 For further information on working with an architect to create a bespoke staircase give us a call on +44 1962 813344.